Ooh I love fashion! The look of clothes, the feel, the colours! Its like a sweet shop! I have some items on a wish list...sooo much but I narrowed it down to only a few items! Love this gorgeous peplum top with leopard print belt! I have a black version, but would love this colour! It is gorgeous! Teamed with a black pencil skirt and skyscraper heels! £25.00. I love the sophisticated look of these shoes, have always loved pointy shoes, they make me feel like I am glamorous!! The style of these are divine with the gold heel and detail down the side. River Island £50.00. 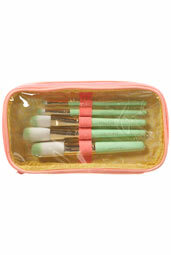 These brushes are so sweet! They are from Topshop and are by Louise Gray who is collaberating. Love the mint green! £32.00, a little pricey but look great! Not sure how they feel but from Louise Gray I imagine they would be fantastic. This has to be my favourite piece at the moment!! 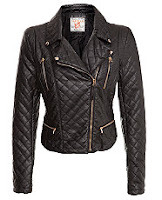 A quilted leather biker jacket!! Oh my days! I love biker jackets and havent seen one like this before and i want one!! £44.99 from New Look. 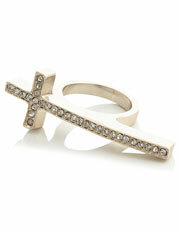 Lastly crucific knuckleduster ring! Have seen many of these but not with the added sparkle which you can never go wrong with! Accesorize £7.00. 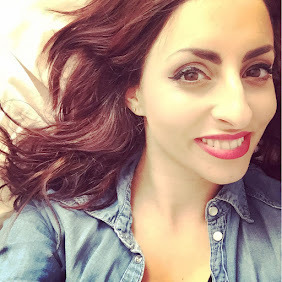 Hope you like my wish list!! If anyone wants to get me any of it I would really appreciate it! wink wink!lol! The peplum top is very pretty. Lovely wishlist!! Love the peplum top! About the white pumps, I've seen similar pumps at H&M for almost half the price :) Maybe you can take a look at it!